YARMOUTH — Opening of Art Quilts Maine’s exhibition of contemporary quilts in show “Off the Beaten Path” 5:30-7 p.m. Friday, Jan. 18, at Stonewall Gallery, 118 East Elm St. Wine, cheese, and light refreshments will be served at this free opening reception. The Stonewall Gallery is the latest venue for “Off the Beaten Path,” which will travel to other galleries around the state in the coming year. For the show, members were challenged to depict a road, trail, map, or even an aerial view in their quilt. 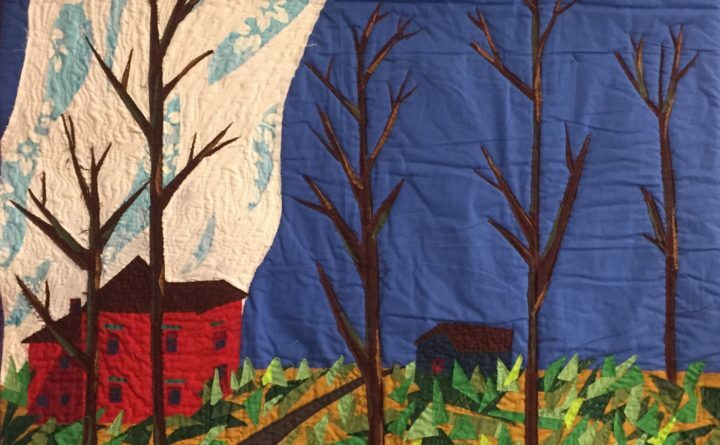 Art Quilts Maine is dedicated to supporting members in their exploration of contemporary quilt art, inspiring creativity and individuality, and promoting the understanding, appreciation, and recognition of contemporary quilters in the state of Maine. “Off the Beaten Path” will be on view at Stonewall Gallery through March 2. The Gallery is located inside the Yarmouth History Center at 118 East Elm St. and is open 10 a.m.-5 p.m. Tuesday through Saturday.